Got kids and cargo and need them to be someplace else that's hard to get to? This is a great choice. It's happier out of town than in, though. Miss 4: It’s so big! I so excited! Mr. 14: That’s pretty awesome. The wife: I’m not driving that [it's too big]. It’s proper massive. Enough to not even fit in with the Sydney Lower North Shore Mosman Monster Truck crowd. That said, if you’re using all seven seats, it’s basically a bus and the kids love it. But we were worried about squishing some of them too. 3.2 litre Diesel. Six-speed automatic. Rated at 8.4l/100KM. We were hitting just over 9l/100KM when grinding round town or hurtling along back-roads. Around town – the beast growls loudly at you (and everyone else) when doing under 50. It’s like it wants to be let off the leash. While it can fit in many kids in for a school run (thanks to the seven seats) it might take a few out if you’ve got to navigate tight, traffic-filled roads thanks to the high ride height and associated blind-spots. That said, despite the height it didn’t feel like a truck at all. There's not a huge girth around this car - it drops straight down from the plentiful windows meaning that visibility is good and guessing where the car ends and an obstruction begins is relatively simple. Once we got up the motorway and hit the high-speed back roads, this thing absolutely flew along. Even in torrential rain it felt completely grounded when fully-laden and travelling at the full speed limit around bends on dodgy forest roads. There probably wasn’t a better car for the job, frankly. That said, when speeding through standing water, our real wheel drive version did feel like it lost the front on two occasions albeit for a millisecond. We also found that going up a remote, super-steep unsealed road without having 4WD was a risk we didn’t quite trust the heavy machine to take. The radar assisted cruise control was great for long journeys and really felt like a nice backup if something in front of us slowed suddenly (except for the two occasions where it didn’t work!) If it did detect a potential collision it would light up with an alarm beamed on the front windscreen. It did this often enough to be reassuring and not often enough to be annoying. Unsealed roads in NSW Wine Country. A perfect travelling companion. There’s plenty of headroom for tall people. Seven people do fit comfortably when the rear seats are up. We found putting kids seats in the back row and grandparents in the middle row worked best as crawling into the rear row can be tricky for seniors. It’s comfy for long (two-hour plus) journeys and while it’s not the most luxurious finish, it’s fully functional and feels easy to clean. 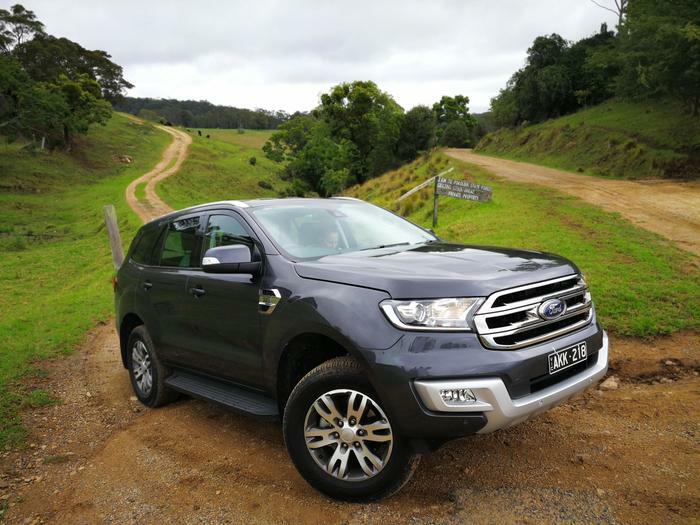 If you remember that the Everest is based on the chunky Ford Ranger Ute’s chassis, you’ll get a feeling for the comfort-layered-on-utilitarian vibe of the interior. Radar assisted cruise control was great for helping with long drives if there was any other cars around. We found ourselves accelerating and decelerating mostly by flicking a switch on the steering wheel up and down to adjust speed. Feet became redundant. Collision detection screamed at us if we were coming in too hot. There’s dual air con for driver and passenger plus extra air con in the back. GPS is available but we found it mediocre for searching for stuff. Power sockets (230V | 150W) are available as are twin USB ports and cigarette lighter power sockets. There are many lighting tweaks. Ford’s Sync3 system is used instead of the more-powerful Apple and Android systems. Full specs can be seen here. Initially the answer was no, but once used to the size… yes. There’s little that won’t fit in it. Would prefer the 4WD version out in the wilderness though. Just in case a rogue mountain or ditch needed to be climbed. If you’re taking many people across country then this beast is brilliant. It’s comfy and easy to drive and feels planted in most situations. If you’re going up really steep unsealed tracks though, having 4WD will give you more peace of mind.